Currants - Are You Ready for a Change? Red currants are a type of berry and are available frozen year-round and fresh during the summer months and near Christmas. They are tart, and most people don't eat them plain, but use them to prepare jelly, wine, sauces or garnishes. 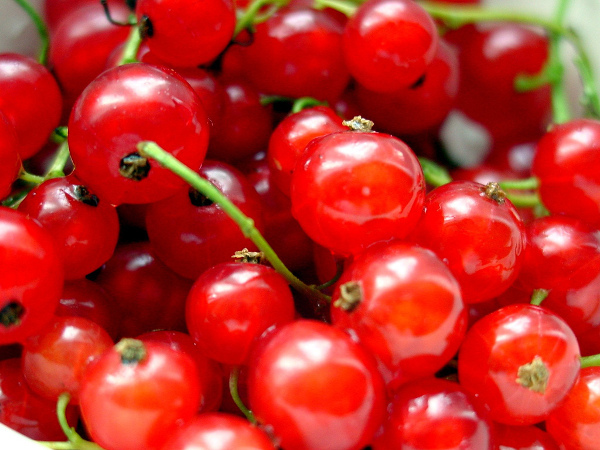 Whatever you decide to do with red currants, eating them as part of a well-balanced diet offers health benefits. If you take care to keep your daily fat and calorie intake within the recommended amount, you are better able to control your weight, and your risk of many health problems decreases. For a 2,000-calorie diet, this means getting 78 g of fat or less per day. A cup of red currants contains only 63 calories and less than 1 g of fat. With nearly 5 g of fiber per cup, red currants are a healthy food that helps you reach your daily totals, which is 21 g to 25 g for women and 30 g to 38 g for men. Fiber is a nutrient that helps to regulate your digestion and bowel function as well as treating constipation and other digestive problems. Getting enough fiber in your daily diet is also associated with keeping cholesterol levels healthy, reducing your risk of heart disease. Another perk to fulfilling the fiber requirements is appetite control. Fiber contains no calories and is digested slowly, which means that adding some red currants to your meal plan could help you feel full longer. Potassium is needed to regulate blood pressure, which is an important way to keep your heart healthy. It is also necessary for muscle and bone contraction and aids in digestion. A cup of red currants contains 308 mg of the recommended 2,000 mg of potassium you should get each day. A deficiency could result in muscle cramps, weakness and an irregular heartbeat. A cup of red currants contains about 46 mg of vitamin C. The daily intake recommendations for vitamin C are 75 mg for women and 90 mg for men. Adequate vitamin C intake protects your immunity and produces collagen, which keeps your skin healthy and aids in wound healing. Vitamin C is an antioxidant, or a plant compound that fights free radical damage. Exposure to free radicals occurs due to toxins in the environment, such as cigarette smoke or industrial pollution, and could result in the development of cancer and heart disease. Magnesium is important for your body because it protects the health of your bones, plays a role in heart function and is involved with your nerves and muscles. It also helps regulate blood sugar and blood pressure as well as protecting your immunity. A cup of red currants contains 15 mg of magnesium. Aim to get 310 to 420 mg of this nutrient each day. Incredibly rich in numerous health benefiting phyto-nutrients and anti-oxidants, black currants are indeed one of the very popular summer season berries. Currants are native to central and northern Europe and Siberia. Currant is a small shrub belonging to the family of Grossulariaceae, of the genus; Ribes and has the scientific name: Ribes nigrum. In general, currants grow best in regions where summer is humid but winter is severe and chilling. It is a fast growing, deciduous, small shrub reaching about 5-6 ft tall. During each season, the shrub bears pendulous chain of small berries. The fruit has size of about 1 cm in diameter, very dark purple, almost black, with a glossy skin and a persistent calyx at the apex, and containing 3-10 tiny seeds. Berries of red, white and pink currants are translucent, sweeter in taste, but less nutritional than black varieties. Black currants have significantly high amounts of phenolic flavonoid phytochemicals called anthocyanins. Scientific studies have shown that consumption of blackcurrants have potential health effects against cancer, aging, inflammation, and neurological diseases. Black currants have anti-oxidant value (Oxygen radical absorbance capacity- ORAC) of 7950 Trolex Equivalents per 100g, which is one of the highest value for fruits after chokeberries, elderberry, and cranberries. Red currants, however, possess comparatively less ORAC value at 3387 TE than the black variety. These berries are an excellent source of antioxidant vitamin, vitamin-C. 100 g of fresh currants provide more than 300% of daily-recommended intake values of vitamin C. Research studies have shown that consumption of fruits rich in vitamin C helps the body develop immunity against infectious agents and also help scavenge harmful oxygen-free radicals from the body. Black currants are very good in vitamin A, and flavonoid anti-oxidants such as beta-carotene, zea-xanthin and cryptoxanthin levels. 100 g fresh berries provide 230 IU of vitamin A. These compounds are known to have antioxidant properties. Vitamin A is also required for maintaining integrity of mucus membranes and skin, and essential for healthy eye-sight. Furthermore, consumption of natural fruits rich in flavonoid anti-oxidants helps to protect from lung and oral cavity cancers. Fresh blackcurrants are also rich in many essential vitamins such as pantothenic acid (vitamin B5), pyridoxine (vitamin B-6) and thiamin (vitamin B-1). These vitamins are essential in the sense that body requires them from external sources to replenish and required for metabolism. They also contain good amounts of mineral iron. 100 g currant berries provide about 20% of daily recommended levels. Iron is an important co-factor for cytochrome oxidase guided cellular metabolism. It is also required for red blood cell (RBC) production in the bone marrow. Additionally, the berries are also a very good source of other important minerals like copper, calcium, phosphorus, manganese, magnesium, and potassium, which are very essential for body metabolism.